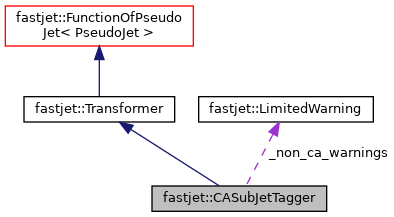 class to help us get a clean (almost parameter-free) handle on substructure inside a C/A jet. It follows the logic described in arXiv:0906.0728 (and is inspired by the original Cambridge algorithm paper in its use of separate angular and dimensionful distances), but provides some extra flexibility. By default, the zcut is calculated from the fraction of the child pt carried by the parent jet. If one calls set_absolute_z_cut the fraction of transverse momentum will be computed wrt the original jet. original code copyright (C) 2009 by Gavin Salam, released under the GPL. by calling set_dr_min(drmin), one can ask that only the recombinations where the 2 objects are (geometrically) distant by at least drmin are kept in the maximisation. the element of the cluster sequence maximising the requested distance (and satisfying the zcut) is returned. Definition at line 106 of file CASubJetTagger.hh. If (abs_z_cut) is set to false (the default) then for a splitting to be considered, each subjet must satisfy. 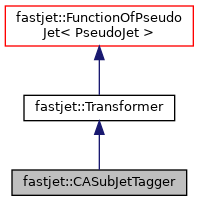 where parent is the immediate parent of the splitting, and original jet is the one supplied to the run() function. Only relevant is called prior to run(). Definition at line 146 of file CASubJetTagger.hh. Definition at line 69 of file CASubJetTagger.cc. Definition at line 105 of file CASubJetTagger.cc.